I have to admit, I'm the last person to want to eat energy gel or bar during any of my workout. Most are gooey sickly sweet or simply too cumbersome for me to munch. 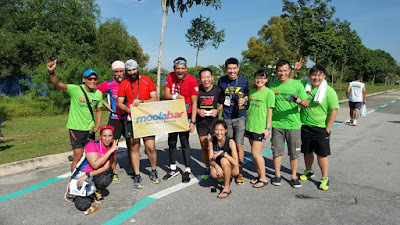 But of late, I'm rather partial at this one local brand energy bar called Moolabar (website: eazymoola.com) which is the product of Agro Jerneh Sdn Bhd; helmed by a young entrepreneur and also a fellow runner, Mohsein Shariff. Mohsein (fourth from left, standing) and friends after finishing a full marathon at Cyberjaya Twincity Marathon in January 2016. My stash for our family's hike earlier this year. We took some when we went vacationing in Japan and ate it as snack during our hikes in Wakayama. I only needed one bar to tide me over during our 50K LSD early February. 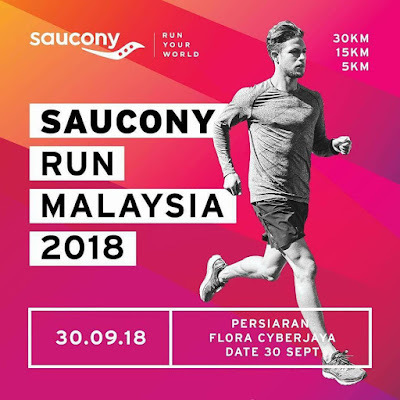 OK, so I drank a lot and ate half a plate of fried bihun too during our 11hour LSD but seriously, that one bar tide me over for the next 25K as the solid food taken apart from fluids. Now, that's saying something, right? 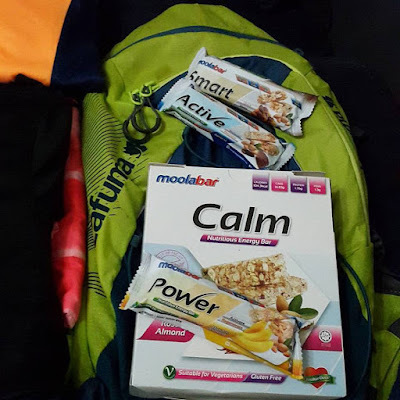 I'm not saying that it is a miracle bar or a replacement meal option but Moolabar worked well for me so far as part of my hunger management and nutrition need during my hikes and training. The granola bar is made with 100% natural ingredients, low in calories and is also gluten-free.With its packaging, it's really easy to bring it anywhere, even stashing one in my pocket when I go out for a run (or putting it in a hydration belt). 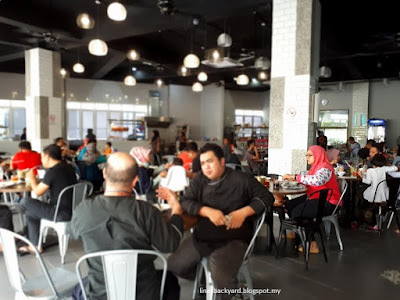 Best of all, Moolabar is Halal certified by JAKIM and produced in a GMP, HACCP and ISO 22000. Bulk purchase of 24 ctn box at RM220.00 which made sense if buying for a group, I guess. A box has 6 bars inside. And it's quite affordable compared to other energy bars available in the market. the energy bar looks very delicious leh.. i like the one with fruits and nuts..
Snacks is for the in-between meals, right? I have been a regular eater for cereal and energy bars for many years as they are convenient esp when we travel or even dieting. I will pay attention to this new MOOLABAR!! When Lina says it's good, I always believe! I like granola bars. Must check out this Moolabar. lina, do you know when will be the King of Bukit Larut 2016? I have no news so far. I will try to find MOOLABAR for next KOBL run. Didn't see this moolabar in SG yet but me too, dislikes the gel but opted for bar even i do hm. 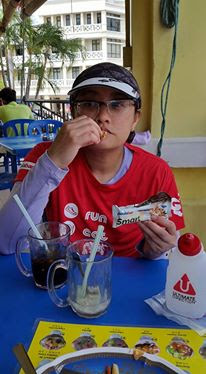 I usually took a bite after 10km and sometimes chew on some energy cubes every 5km. Hahah... When I got the gel free sometimes in my goodies bag, I usually threw it away. Running In A Onesie, Anyone?